The Winchester 1897 shotgun was probably the first really successful pump action shotgun ever made. It was designed by legendary American gunsmith John Browning and his half-brother Matthew. It first appeared as a black-powder only version in 1893. The ultimate version earned worldwide fame as the ‘Winchester model 1897 shotgun’, or simply ‘Winchester 97’, (the model designation was officially shortened by two digits in 1917). It made its first appearance in 1897 repurposed for the then-new smokeless powder loads. Produced by the Winchester Repeating Arms Company until 1957, more than a million guns have been made in a wide array of configurations. The early guns were optimized for hunting and so had relatively long barrels for greater accuracy. Winchester engineers however, soon introduced the so called ‘Winchester Model 1897 Riot Gun’, which featured a shortened barrel and was intended for police and guard use. Once the US entered World War One in 1917, the riot gun was further repurposed for military use, resulting in the so called ‘Winchester model 1897 trench gun’. This version differed from the riot gun in that it featured a bayonet mount and had a heat shield over the barrel. Its use in the First World War by American troops drew and official complaint from German armed forces. The Winchester 97 trench gun was extensively used during both World Wars, as well as during the Korean and early Vietnam wars, and its ‘riot’ cousin gained popular acceptance among many US law enforcement agencies. As a fighting firearm it is long past obsolete now, but the NORINCO corporation of China offers inexpensive copies of the original gun in hunting and trench versions, for modern shooters who like its vintage looks but cannot afford the now collectible originals made by Winchester more than a half-century ago. 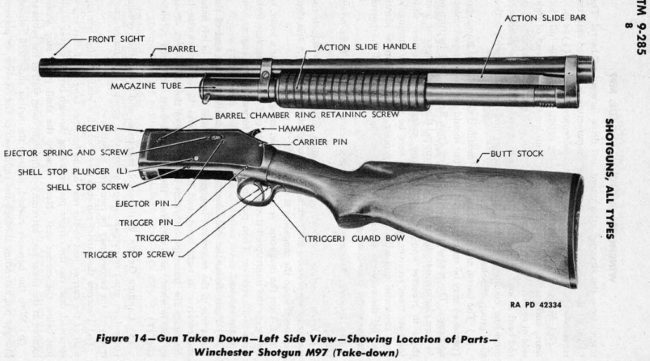 The Winchester 1897 shotgun is a manually operated, slide (pump) action weapon. Its operating slide / forearm is connected by a single action rod with the bolt and cartridge lift. The latter is a massive part of complex design performing several functions, and serves as a bolt lock and a cartridge lifter. When the gun is in battery, the forward top part of the cartridge lift rests against a machined step on the bottom of the bolt, blocking its rearward movement under pressure from the fired cartridge. When the slide is pulled to the rear, its initial movement tilts the cartridge lift down to unlock the bolt. Once the bolt is unlocked, a further pull of the slide retracts the bolt to the rear, extracting and ejecting the fired shell from the barrel. At the same time, a fresh shell is pushed from the underbarrel tubular magazine into the upper shelf of the lift. Forward movement of the slide first raises the lift to the intermediate ‘feed’ position and then forces the bolt forward, chambering the next round. At the final stage of the forward slide movement, the lift is tilted up to lock the bolt, and the gun is ready to fire. The Winchester 97 features a hammer-fired trigger system with exposed hammer and no manual safeties. It also has no trigger disconnector, permitting the gun to be ‘slam fired’, by cycling the slide as fast as possible and holding the trigger to the rear constantly, so the gun fires ‘automatically’ as soon as the next round is chambered and locked. Most Winchester model 1897 shotguns were produced with traditional wooden stocks. Some models were offered as ‘take-down’ models for more compact storage and transportation. Hunting guns were made in a variety of calibers, while Trench and Riot guns were made in 12 gauge only.